Visit the Downing Children's Garden, a safe and engaging environment where children can be surrounded by plants and discover the joys of being in a garden! Located a short distance from downtown Wichita. 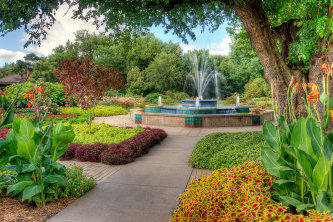 With ever-changing scenery, educational classes for young and old, and special events to entertain and amuse, we invite you to visit Botanica often and take advantage of all that the Gardens have to offer! Now Open: Monday-Saturday 9am-5pm, Sunday 1-5pm and Tuesday and Thursday evenings until 8pm. Admission Rates: Adult- $7.00, Senior (62+)/Military- $6.00, Youth (3-12)- $5.00, Children under 3 admitted free. Admission is $3.00 for all ages on Thursdays. Discounted rates are available for groups of 10 or more. Group rates and tours can be arranged by contacting Kelsey Webb at 316-264-0448.